In honor of the Memorial Day holiday, I thought I’d take a look at some of the perhaps little known canine veterans. 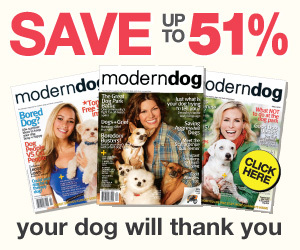 Dogs have been used in a military capacity as far back as the Revolutionary War in the late 1700s. 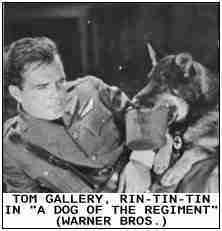 Every soldier who “brings with him a strong dog” was paid three shillings a month! Even by the time of World War I the US did not have an established K9 program while other countries already had sentry and courier dog programs. The Germans lead the field in military dogs with over 30,000, the Italians 3,000, and the US borrowed dogs from our allies or troops brought dogs with them. 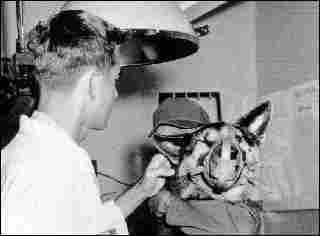 The breed of the military dog in the early years was much smaller; terriers, pit bulls, collies, and some shepherds. The job of the military dog was to bring cigarettes to troops, be a courier, establish the whereabouts of the wounded, bring medical supplies, act as guard dogs, be a mascot, etc. By the time of Vietnam, the US was still far behind the rest of the world in terms of military dogs. A little over 500 dog teams were employed in Vietnam, but over 4,000 dogs during the course of the war. While there were 3 canine casualties, not one base was taken by Viet Cong that was guarded by sentry dogs. The sentry dogs were vital in giving the soldiers enough warning when a base was being approached. In the modern era, dogs are mostly used for bomb, drug, fire/explosive detection, search and rescue, and patrol and attack. German shepherds, Dutch shepherds, and Belgian Malinois are almost exclusively used for “sniffing” operations. The military has their own Dog School where canines are tested for temperament, physicality, gun shyness, and other items and then run through extensive training not unlike “regular” dog training. There are so many examples of heroic dogs, from many different countries, I couldn’t possibly profile them all. Here’s a sampling. 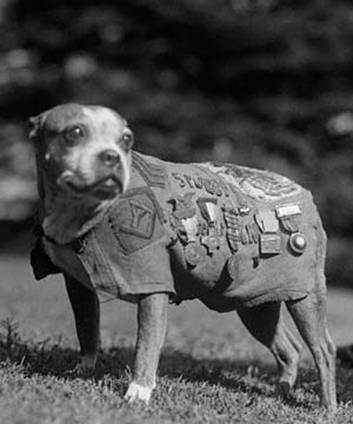 Stubby was a pit bull mix in WWI who served for 18 months. 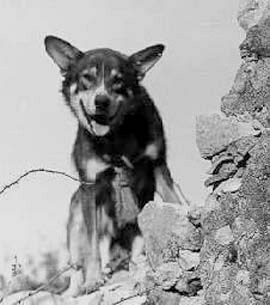 Stubby alerted for gas attacks, attacking German soldiers, and was even injured by a grenade. Stubby was promoted to the rank of Sergeant and met three different presidents! Sergeant Stubby’s remains are in the Smithsonian. Chips was a German Shepherd/Collie mix donated to the army by a New York family. Chips flushed out enemy troops to be captured and stormed machine gun nests. He was wounded in the head and was awarded the Distinguished Service Cross, Silver Star and Purple Star for bravery (these were later revoked due to a military rule about medals being given to non-humans, hmm). He returned home to his family in New York after his tour of duty. Nemo is a German Shepherd that was on patrol with his handler in Vietnam when he alerted on something and gun fire broke out. He was shot in the face and his handler was also shot. Undeterred, Nemo attacked the Viet Cong which gave his soldier enough time to call in backup- who got there and cleared the area of any more enemies. To protect his soldier, Nemo laid on top of him and the medics had to get Nemo and the soldier to the hospital for care. 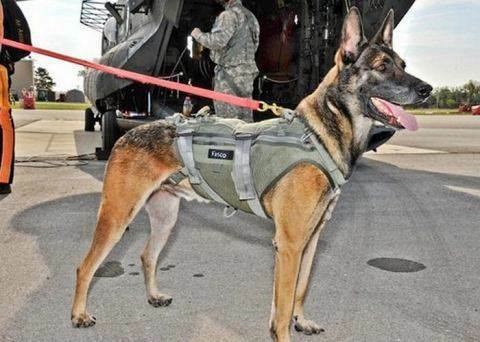 Cairo is a very special Belgian Malinois that is part of the SEAL Team Six group that stormed Osama Bin Laden’s compound. 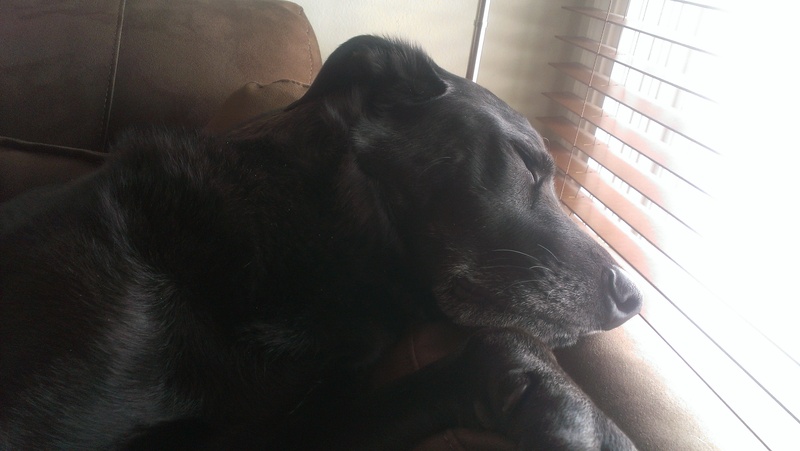 Cairo’s job was to detect bombs and explosives, flush out enemies, and detect secret passageways. Cairo even helped secure the perimeter. Cairo was even present when President Obama met with the SEALs who carried out the operation. This Memorial Day as we honor our veterans who died while serving our country, let’s not forget the canine veterans that helped along the way.